Trichomonosis, caused by Trichomonas vaginalis, is the number one, nonviral sexually transmitted infection that has adverse consequences for the health of women and children. The interaction of T. vaginalis with vaginal epithelial cells (VECs), a step preparatory to infection, is mediated in part by the prominent surface protein AP65. The bovine trichomonad, Tritrichomonas foetus, adheres poorly to human VECs. Thus, we established a transfection system for heterologous expression of the T. vaginalis AP65 in T. foetus, as an alternative approach to confirm adhesin function for this virulence factor. In this study, we show stable transfection and expression of the T. vaginalis ap65 gene in T. foetus from an episomal pBS-ap65-neo plasmid. Expression of the gene and protein was confirmed by RT-PCR and immunoblots, respectively. AP65 in transformed T. foetus bound to host cells. Specific mAbs revealed episomally-expressed AP65 targeted to the parasite surface and hydrogenosome organelles. Importantly, surface-expression of AP65 in T. foetus paralleled increased levels of adherence of transfected bovine trichomonads to human VECs. 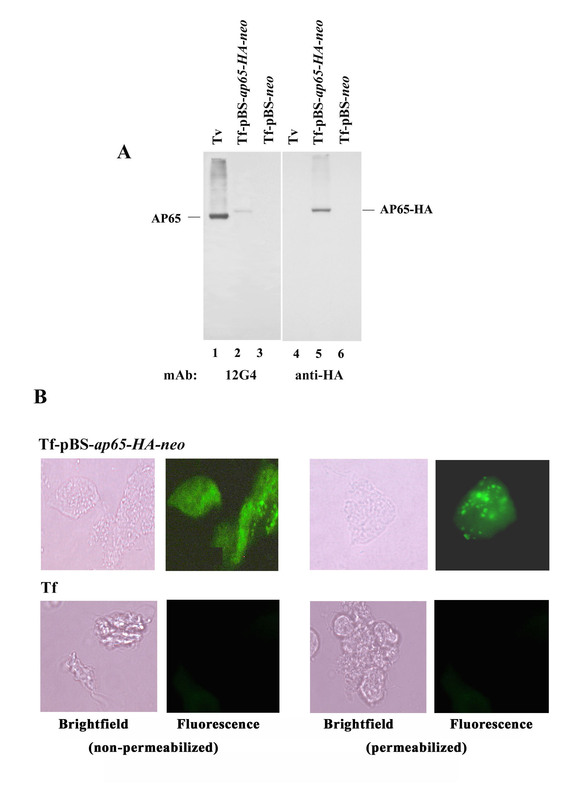 The T. vaginalis AP65 adhesin was stably expressed in T. foetus, and the data obtained using this heterologous system strongly supports the role of AP65 as a prominent adhesin for T. vaginalis. In addition, the heterologous expression in T. foetus of a T. vaginalis gene offers an important, new approach for confirming and characterizing virulence factors. The colonization of the urogenital tract of humans by the protozoan parasite Trichomonas vaginalis is responsible for trichomonosis , the most prevalent, non-viral sexually transmitted infection worldwide. Despite an estimated 8 million new cases per year in the United States alone , this health disparities disease  remains poorly studied. T. vaginalis infection is associated with adverse health consequences to both men and women, including infertility [4, 5], atypical pelvic inflammatory disease , and increased HIV transmission [7, 8]. Trichomonosis is also associated with preterm birth, low birth weight infants , predisposition to development of cervical neoplasia  in women and non-gonococcal urethritis  and chronic prostatitis  in men. T. vaginalis adherence to host VECs, a step preparatory to infection , is complex and involves four surface protein adhesins. Three adhesins studied to date at the molecular level share identity with metabolic enzymes of the hydrogenosome organelle [14, 15]. Thus, the proteins exhibit functional diversity based on cellular location. AP65 is a prominent T. vaginalis adhesin that is targeted both to the surface and hydrogenosomes, and this compartmentalization is in part modulated by iron . Further, the surface placement of AP65 is increased upon contact with host cells . Recently, silencing of ap65 gene expression in T. vaginalis with antisense reinforced the role of AP65 as a major adhesion . The related Tritrichomonas foetus is a causal agent of bovine fetal wastage [17, 18]. Adherence by T. foetus to bovine VECs appears equally complex as that seen for T. vaginalis except that in this case, adherence involves glycoconjugates [19, 20]. Interestingly, the interaction between T. foetus organisms and VECs is both cell- and species-specific [21, 22]. For example, T. foetus attaches to bovine VECs, MDCK and HeLa epithelial cells, which have been used previously for studies on the host-parasite interaction. However, the bovine trichomonads have low background levels of adherence to human VECs. This may suggest that the phylogenetically-related T. vaginalis and T. foetus trichomonads differ in mechanisms of host parasitism and cytopathogenicity. We hypothesized that, given the different mechanisms of host VEC adherence by T. foetus and T. vaginalis, the heterologous expression in T. foetus of the T. vaginalis AP65 could be an alternative approach to confirm the function of AP65 as an adhesin. Importantly, no cross-hybridization and immuno-crossreactivity with ap65 and mAbs to AP65, respectively, were evident in T. foetus. We now show the stable expression in T. foetus of a single copy of the T. vaginalis ap65 gene encoding an ~65-kDa protein . The stable transfectants expressed functional AP65 on the T. foetus surface. These findings importantly illustrate the utility of a stable transfection system for heterologus expression in T. foetus of T. vaginalis virulence genes. We wanted to perform comparative binding experiments between T. vaginalis and T. foetus to epithelial cells used in adherence assays . Given the fact that T. foetus exhibits host tissue- and cell-specificity , it was not surprising to find the lower levels of adherence by T. foetus to HeLa epithelial cells and immortalized human MS-74 VECs. As shown in representative experiment in Figure 1, at best only 40% levels of adherence were seen for T. foetus compared to T. vaginalis. Tritrichomonas foetus has lower levels of adherence to HeLa epithelial cells and immortalized human MS-74 VECs and has no detectable ap65 adhesin gene. (A) Bar graph showing the mean level of adherence by T. foetus (shaded bars) derived from four independent adherence experiments, each of which was performed with quadruplicate samples. Adherence levels of T. vaginalis (open bars) were normalized to 100% for comparative purposes. (B) Northern analysis to detect ap65 mRNA amounts was performed using 10 μg of total RNA per lane separated on 1.2% agarose-formaldehyde gels and transferred to Hybond-P membranes. The blot was probed with DIG-labelled ap65, which hybridized to an ~2-kb ap65 transcript in T. vaginalis, as before . No similar signal was detected in T. foetus and the drug resistant MR100 T. vaginalis used as a negative control . (C) Ethidium bromide (EtBr)-stained RNA gel showing the rRNA bands. Equal loading of RNA in all the lanes is evident by similar amounts of the rRNA bands, which served as internal controls for the Northern blot in part B. We next wanted to know if T. foetus had mRNA that hybridized to ap65 used as a probe. As shown in Figure 1B, no RNA band was detected by Northern analysis for T. foetus (lane labeled Tf). In contrast, a band of ~2-kb was readily hybridized by total RNA of T. vaginalis. MR100, the drug-resistant T. vaginalis that is unable to adhere to host cells as shown recently also had no detectable ap65 transcript, as a control . The equivalent amounts of rRNA bands seen in Figure 1C illustrate that similar amounts of RNA were added to the lanes used in the Northern blots (Figure 1B). The expression plasmid pBS-ap65-neo contains the neomycin (neo) gene, and as done recently, the transfectants were selected for Geneticin resistance at 100μg/ml . As shown in Figure 2A, the presence of plasmid in transfectants was verified by PCR amplification of the neo coding region. A band of 750-bp was detected in the transfectants corresponding to pBS-ap65-neo (lane3) and pBS-neo (lane 4). Not unexpectedly, no PCR products were obtained using T. vaginalis (lane 1) and T. foetus (lane 2). Transfection and episomal expression of ap65 in T. foetus. (A) Agarose gel stained with EtBr shows results of a PCR reaction to amplify the 795-bp neo gene from transfected T. foetus total genomic DNA. The neo gene PCR product is detected only in T. foetus transfected with pBS-ap65-neo (lane 3) and pBS-neo (lane 4), but not the wild type T. foetus (Tf; lane 2) and control T. vaginalis (Tv; lane 1). (B) Agarose gel stained with EtBr shows RT-PCR products for the ap65 transcript in wt T. foetus (lane 1), T. vaginalis (lane 2), T. foetus transfected with pBS-ap65-neo (lane 3), and T. foetus transfected with the pBS-neo plasmid as a negative control. RT-PCR was performed using primers to amplify a 580-bp region of the ap65 gene and a 650-bp region of the a-tubulin gene used as an internal control. We then checked for the episomal gene expression by means of RT-PCR. The PCR products following reverse transcription were separated on 1% agarose gels. Figure 2B confirms the presence of an ap65 band corresponding to 580-bp amplified from the transfectants with pBS-ap65-neo (lane 3), confirming the expression of ap65 from the plasmid. The same band is also seen in T. vaginalis (lane 1). As an internal control in these experiments, the common band of 650-bp seen in all lanes corresponds to the a-tubulin gene. This control was important to show the similar amounts of RNA used for RT-PCR in all samples. These results demonstrate that the episomal plasmid with the T. vaginalis ap65 gene is successfully expressed in transfected T. foetus. We next wanted to confirm that the episomal ap65 transcript seen in Figure 2 was translated. 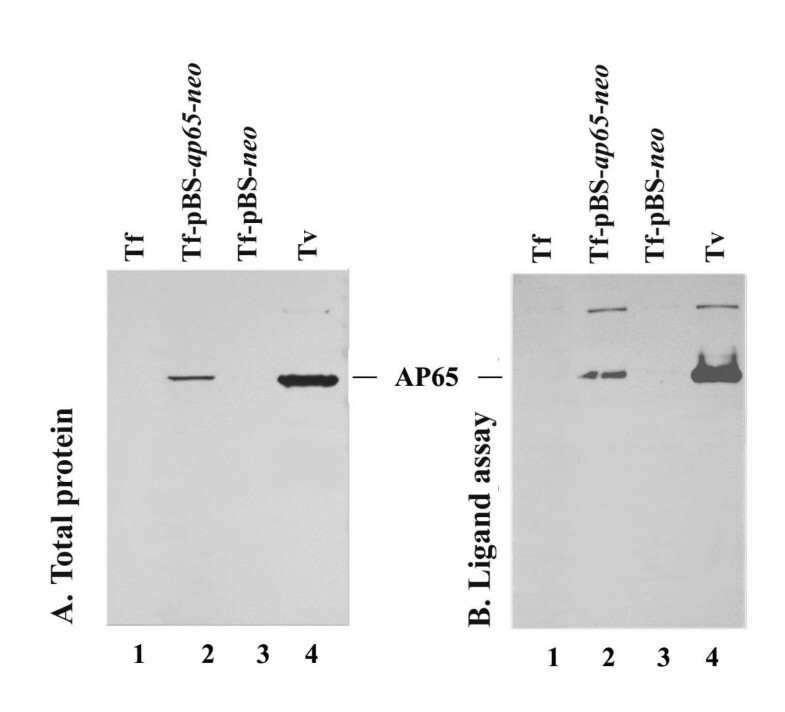 A 65-kDa band was readily detected by mAb 12G4 to AP65 in immunoblots of extracts of total proteins from T. foetus transfected with pBS neo-ap65 (Figure 3A, lane 2), and the protein had the same size as AP65 detected in total protein blots of T. vaginalis (lane 4). There were no detectable bands in either wild type T. foetus (lane 1) or T. foetus transfected with the control plasmid (lane 3). This result also confirms that the 12G4 mAb did not cross-react with any protein in blots of T. foetus. Monoclonal antibody (mAb) detects AP65 expressed in pBS- ap65-neo (Parts A and B) and pBS- ap65-HA-neo (Part C) transfected T. foetus parasites. (A) Total proteins from 107 parasites were separated on 10% SDS-PAGE and blotted onto Hybond-P membranes for probing with mAb DM116 specific for AP65, as before (Garcia et al., 2003). The AP65 protein was readily detected in total protein blots of transfected T. foetus (lane 2) and T. vaginalis (lane 4), but not in wt T. foetus (lane 1) and in T. foetus transfected with the control pBS-neo plasmid (lane 3). The migration of detected AP65 was ~65-kDa as expected based on molecular weight standards. (B) A ligand assay showing AP65 binds to immortalized human MS-74 VECs, as before (Garcia et al., 2003). Parasites bound to VECs were solubilized and electrophoresed as above for blotting onto Hybond-P membranes. The DM116 mAb was used to detect AP65 in transfected T. foetus (lane 2) and T. vaginalis (lane 4). No protein was detected in wt T. foetus (lane 1) and T. foetus transfected with the control plasmid (lane 3). Importantly, we further tested for the ability of episomal AP65 in T. foetus to bind to host cells using a ligand assay [15, 25]. Figure 3B (lane 4) shows a typical result of a ligand assay using T. vaginalis, and mAb 12G4 used as a probe detected AP65 on blots of proteins that bound MS-74 VECs that were solubilized for electrophoresis and blotting. Likewise, AP65 from transfected parasites bound to MS-74 VECs (lane 2) and gave a band with the same Mr. There were no detectable protein bands for wild-type T. foetus (lane 1) and T. foetus transfected with control plasmid (lane 3) handled identically in the ligand assay. These results show the ability of T. foetus transfectants to stably express functional AP65. Further, the lack of any immuno-crossreactivity with mAb is consistent with the absence of transcript (Figure 1B) and illustrates the absence of an AP65-like protein reactive with mAbs in T. foetus. Next, we performed cell membrane fractionation experiments to determine whether episomally-expressed AP65 in T. foetus transfectants localized to the surface membranes. Fractions enriched for membranes and hydrogenosome organelles were obtained by differential centrifugation, and the fractions were used for monitoring the presence of AP65 using a ligand assay. 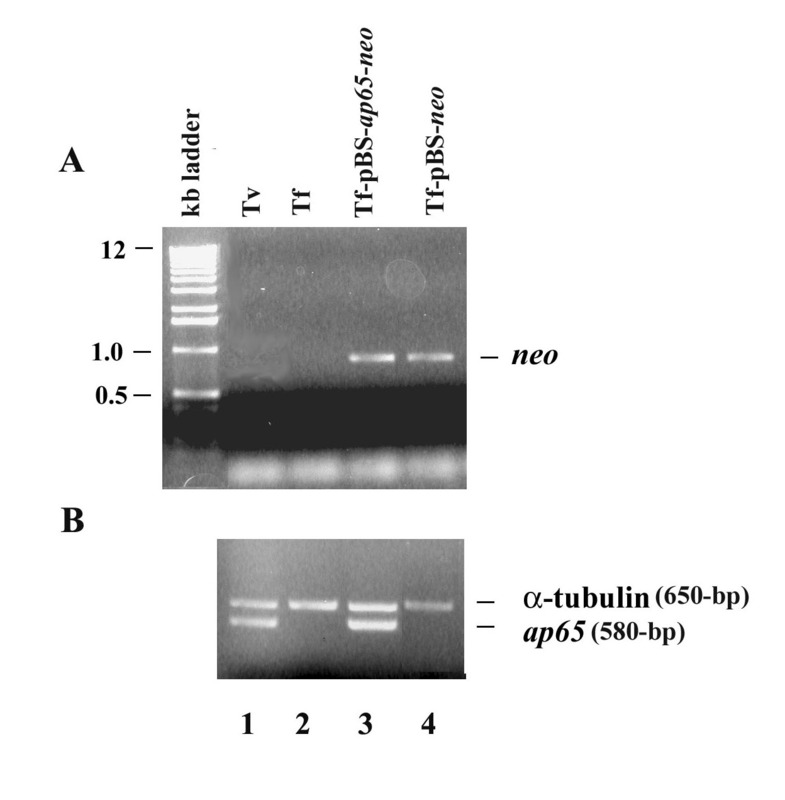 Figure 4A illustrates AP65 detected by mAb 12G4 in blots of total proteins from membranes and hydrogenosomes of T. vaginalis (lanes 2 and 5) and T. foetus transfected with the pBS-ap65-neo plasmid (lanes 3 and 6). As above, no bands were visualized on blots with total proteins of wild type T. foetus (lanes 1 and 4). We then used these fractions to perform a ligand assay, and as seen in Figure. 4B, both membrane and hydrogenosome fractions of T. vaginalis (lanes 2 and 5) and transfected T. foetus (lanes 3 and 6) had AP65 that bound to MS-74 VECs. Wild type T. foetus had no protein detected by mAb from the ligand assay (lanes 1 and 4). Immunoblots with specific mAb 12G4 detecting AP65 immunoprecipitated from extracts of total trichomonad protein preparations (A) and of proteins after the ligand assay (B) derived from purified hydrogenosomes (lanes 1 through 3) and membrane fractions (lanes 4 through 6). AP65 was immunoprecipitated with mAb from protein extracts from hydrogenosomes and membrane fractions of T. foetus (Tf; lanes 1 and 4), T. vaginalis (Tv; lanes 2 and 5), and transfected T. foetus (Tf-pBS-ap65-neo; lanes 3 and 6). Immunoprecipitated AP65 was prepared as described in the Experimental design section and used in a ligand assay to monitor the amount of AP65 adhesin bound to MS-74 VECs as shown above in Figure 3. It was then important to examine the possible placement and accessibility of episomal AP65 on the surface of T. foetus. 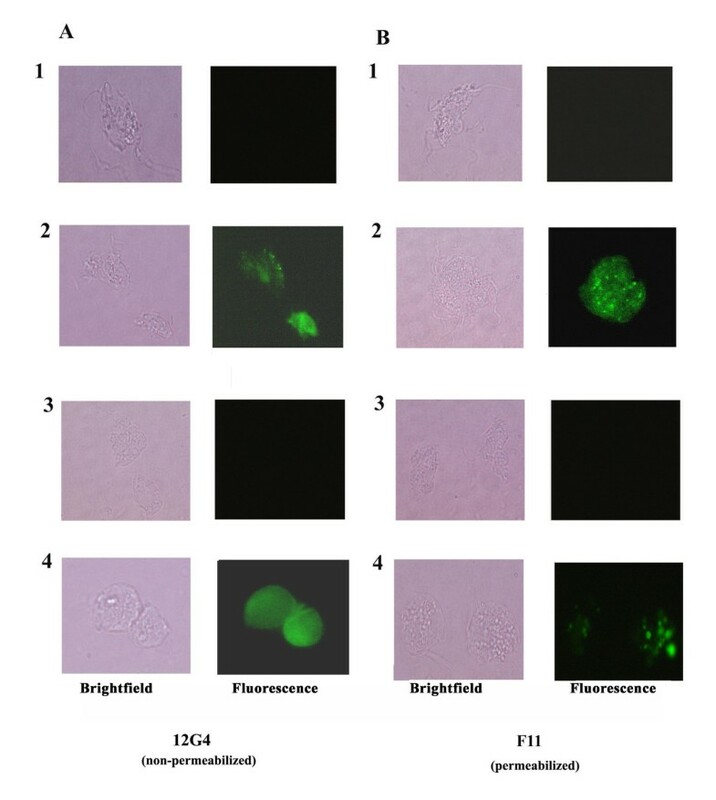 Figure 5 presents immunofluorescence data with T. vaginalis showing mAb 12G4 detecting surface AP65 (A4) and mAb F11 reacting with hydrogenosomal AP65 (decarboxylating malic enzyme) (B4), data consistent with that shown in a recent report by us . 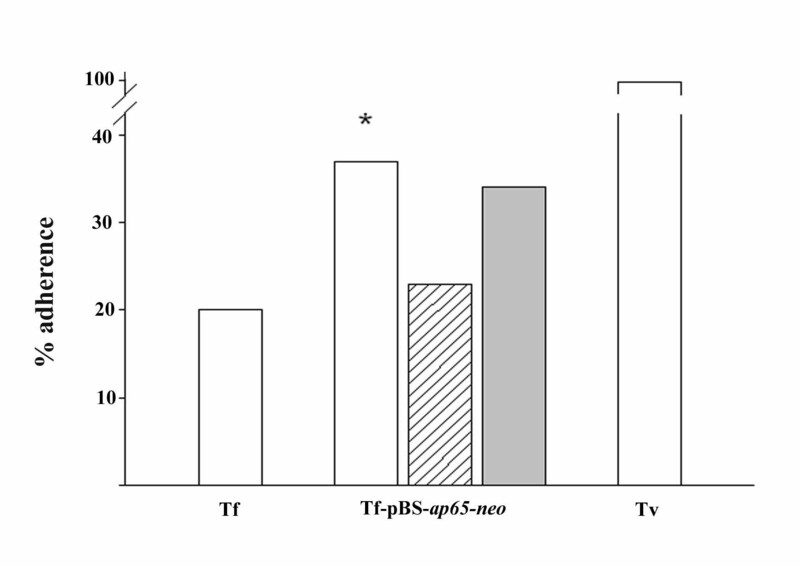 Importantly, as with the fractionation experiments performed above, mAb 12G4 detected AP65 on the surface of non-permeabilized transfected T. foetus (Figure 5A2), and mAb F11 was reactive with AP65 within hydrogenosomes of permeabilized trichomonads (Figure 5B2). 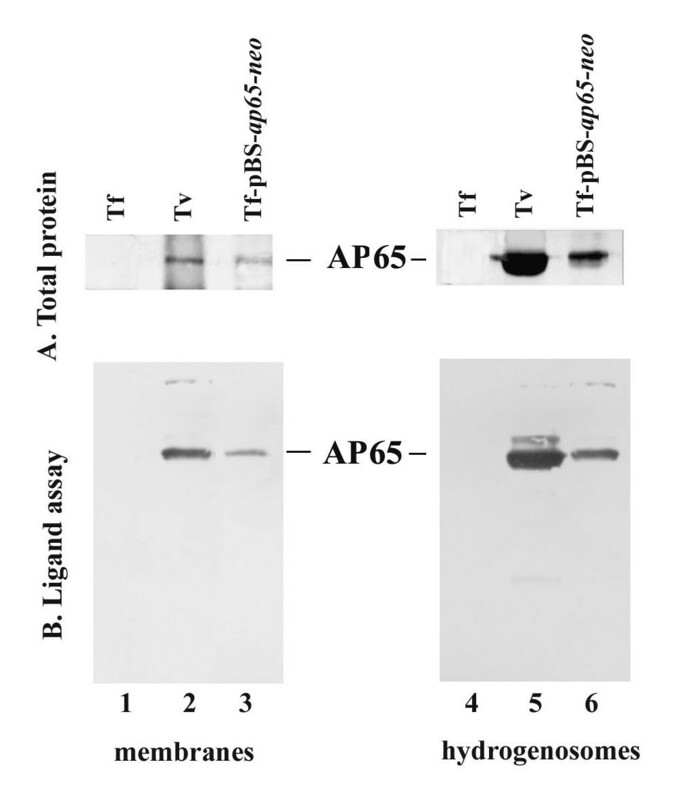 The absence of any fluorescence for wild type T. foetus (A1 and B1) and T. foetus with control plasmid (A3 and B3) reinforced the specific binding of mAbs with episomal AP65 and reaffirmed results from Figures 3 and 4 above. The brightfield pictures are included to show the integrity of the trichomonads in the fluorescence experiments. These data further confirm that episomal AP65 is sorted both to the parasite surface and to hydrogenosome organelles, suggesting that the trafficking signals are present within the AP65 open reading frame and that T. foetus also possesses the protein compartmentalization machinery similar to that of T. vaginalis. Immunofluorescence and corresponding brightfield microscopy showing pBS- ap65-neo transfected T. foetus (Tf-pBS- ap65-neo ) expressing AP65 on the surface of non-permeabilized trichomonads (A2) and in hydrogenosomes in permeabilized parasites (B2). The distinct patterns were obtained with the mAbs 12G4 for surface fluorescence and F11 for hydrogenosome fluorescence shown recently to detect the protein in respective compartments (Garcia et al., 2003). T. vaginalis fluorescence patterns (Tv; A4 and B4) were positive controls, and results are identical to those obtained recently (Garcia et al., 2003). No evidence of fluorescence was seen for wild type T. foetus (Tf) and for T. foetus transfected with control plasmid (Tf-pBS-neo). Control hybridoma supernatant lacking anti-AP65 mAb was unreactive with trichomonads. Having established surface AP65 on transfected T. foetus, we next wanted to confirm surface placement using a different protein construct that would be detected by a distinct mAb. We, therefore, expressed the AP65-HA fusion protein, and immunoblot of total proteins of transfected T. foetus shows a band detected by the anti-HA mAb (Figure 6A, lane 5). As expected, the mAb 12G4 to AP65 detected a protein band in blots of total proteins of T. vaginalis (lane 1) and the pBS-ap65-HA-neo transfected T. foetus (lane 2). The Mr of the fusion protein was higher than AP65, as expected. Also, no bands were apparent with any mAbs in T. foetus with control pBS-neo plasmid (lanes 3 and 6). Immunoblot detection of AP65-HA in T. foetus transfected with pBS- ap65-HA-neo , and immunofluorescence microscopy detecting AP65-HA protein on the surface (non-permeabilized) and in hydrogenosomes (permeabilized). (A) Duplicate immunoblots prepared from total proteins as above were probed with 12G4 mAb to AP65 (lanes 1 through 3) and anti-HA mAb (lanes 4 through 6). AP65 was readily detected by 12G4 in blots of T. vaginalis (lane 1) and T. foetus transfected with pBS-ap65-HA-neo (lane 2) but not T. foetus with control plasmid (lane 3). The anti-HA mAb detected the AP65-HA protein only in T. foetus transfected with pBS-ap65-HA-neo (lane 5). No protein was detectable by anti-HA mAb in blots of control T. vaginalis (lane 4) and T. foetus with the pBS-neo plasmid (lane 6). As an additional negative control for all immunoblots, no protein was detected in the absence of primary antibody or using control hybridoma supernatant. (B) Fluorescence is visualized using anti-HA mAb only in the T. foetus organisms transfected with the pBS-ap65-HA-neo plasmid but not the pBS-neo plasmid. Not unexpectedly, no fluorescence was seen using anti-HA mAb with T. foetus and with the use of control hybridoma supernatant lacking mAb to AP65. Finally, no fluorescence with anti-HA mAb was obtained using T. vaginalis organisms under identical experimental conditions. Finally, as shown in Figure 6B, immunofluorescence microscopy gave a positive reaction with anti-HA mAb with AP65-HA protein on the surface using non-permeabilized and in hydrogenosomes with permeabilized transfected (Tf-pBS-ap65-neo) trichomonads. The T. foetus transfected with the control plasmid (Tf-pBS-neo) was unreactive with anti-HA mAb and gave results identical to those shown for the wild type T. foetus. Finally, in data not shown, no fluorescence with anti-HA mAb was obtained using T. vaginalis organisms as controls under identical experimental conditions. These data using a different mAb to the fusion protein construct independently demonstrated the surface placement of episomal AP65 and AP65-HA on T. foetus. Finally, we wanted to perform a functional adherence assay to determine if episomal, surface-expressed and host cell-binding AP65 on T. foetus, as shown collectively above, would enhance adherence of parasites to immortalized human MS-74 VECs. Figure 7 presents representative data showing that transfected parasites with pBS-ap65-neo were 40% more adherent to VECs when compared to the background level of adherence of wild type T. foetus (Tf). T. foetus with control plasmid gave lower adherence levels equal to wild type parasites (not shown). Importantly, the enhanced adherence was inhibited by 36 % in the presence of rabbit polyclonal anti-AP65 IgG antibody (striped bar), indicating specific AP65-mediated adherence, as before for T. vaginalis [15, 16]. Control normal rabbit serum IgG did not inhibit adherence of the pBS-ap65-neo transfected T. foetus (shaded bar). Levels of adherence were compared with those of T. vaginalis (Tv) and normalized to 100%. T. foetus transfected with pBS- ap65-neo (Tf-pBS- ap65-neo ) displays enhanced levels of adherence to immortalized human MS-74 VECs compared to T. foetus (Tf) parasites. The percent level of adherence was adjusted with that seen for T. vaginalis (Tv). T. foetus with control plasmid gave levels of adherence similar to T. foetus (data not shown). The enhanced adherence obtained with transfected T. foetus (Tf-pBS-ap65-neo) was inhibited by anti-AP65 IgG (hatched middle bar). The solid gray bar (right) represents inhibition by normal rabbit serum (NRS) control. The results are the average from four different experiments, and each experiment was carried out using quadruplicate samples. The statistical significance of the results is indicated by the asterisk above the bar graph. We have shown that trichomonads possess surface adhesins with functional diversity . The adhesins are also enzymes in hydrogenosome organelles involved in energy generation. Although complex and multifactorial, the process of T. vaginalis adherence to human VECs is mediated in part by AP65, the surface protein that plays a major role in adherence [15, 16]. In this study, we established the utility of the T. foetus bovine trichomonad as a heterologous expression model system. We feel that among the noteworthy findings of this report are the following: 1) We show the stable episomal expression of the T. vaginalis prominent ap65 gene (Figure 2). 2) The transcript is translated to form functional AP65 adhesin (Figure 3). 3) Episomal AP65 and fusion AP65-HA are compartmentalized to the surface and hydrogenosomes and are accessible to recognition by specific anti-AP65 and anti-HA mAbs (Figures 4 through 6). 4) AP65 on transfected T. foetus increased adherence to VECs compared to parasites transfected with control plasmid (Figure 7), and the enhanced binding was reduced with anti-AP65 antibodies, showing specific AP65 mediated VEC attachment. The stable expression of T. vaginalis AP65 in transfected T. foetus allowed us to characterize via cell fractionation experiments the cellular location of the episomal protein. Remarkably, AP65 fractionated to the plasma membrane and hydrogenosomes (Figure 4). This fractionation data was reaffirmed by fluorescence experiments (Figure 5), and the ability to detect both surface AP65 and surface AP65-HA using distinct mAbs provides strong evidence for the trafficking of T. vaginalis proteins to distinct cellular compartments in the bovine trichomonad. These results indicate that machinery for recognition of the surface and organelle targeting sequences is similar among these phylogenetically-related trichomonad species. Importantly, the expression of AP65-HA now will permit future subclone analysis for identification of the protein region within AP65 directing surface channeling. That surface AP65 on transfected T. foetus elevated levels of adherence to human VECs (Figure 7) is significant because human VECs are not the natural host cell for T. foetus [27, 28]. The net increase in binding levels above T. foetus wild type controls were specific, as evidenced by the fact that anti-AP65 IgG reduced adherence to original control values. It is not inconceivable that the experimental conditions used here would not increase adherence by transfected T. foetus to those seen by T. vaginalis. One possible explanation is the fact that efficient and optimal adherence to VECs requires at least three additional adhesins, something that has been experimentally verified [15, 16]. Alternatively, the copy number of episomal AP65 on T. foetus may not be optimal for production of amounts of adhesin needed for elevated adherence levels. Such a difference in copy number between AP65 on T. vaginalis and T. foetus (Fig. 3) may not be obvious based solely on fluorescence intensity, as this is not quantitative. In this regard, it may be that the equivalent protein of T. foetus decarboxylating malic enzyme is also surface expressed thereby interfering with sequestration of sufficient molecules of episomal AP65 for adherence. The future availability of specific antibodies to the T. foetus decarboxylating malic enzyme will be useful for testing this possibility. It is noteworthy that the ap65 gene and mAbs to AP65 did not cross-hybridize and immunoreact, respectively, with the equivalent decarboxylating malic enzyme gene and protein known to reside in hydrogenosomes of T. foetus [29, 30]. These data also now indicate that there is significant nucleotide and amino acid sequence divergence between T. vaginalis and T. foetus in these equivalent genes and proteins. Importantly, except for the N-terminal sequence submitted to the GenBank (Accession number AAK55143.1), to our knowledge the entire decarboxylating malic enzyme gene of T. foetus has not been characterized . Finally, not all episomal, surface-expressed AP65 molecules may be in the proper orientation to have adhesive function. Nonetheless, the significant increase in adherence attributable to episomal AP65 by transfected T. foetus once again underscores the role of AP65 in adherence by T. vaginalis. This paper now provides evidence for the functional expression of a heterologous virulence factor in a related trichomonad species. This ability to express T. vaginalis or other foreign proteins using T. foetus as a model is particularly noteworthy, especially if an identical and/or equivalent virulence factor and property are not detectable within the bovine trichomonad. We feel that this approach is innovative and represents a significant advance for understanding the contribution of specific T. vaginalis virulence factors to overall mechanisms of trichomonal pathogenesis. Trichomonas vaginalis isolate T016 and Tritrichomonas foetus (02–97) were grown in Trypticase-yeast extract-maltose (TYM) medium supplemented with 10% heat-inactivated horse serum . Immortalized human MS-74 VECs were grown as detailed recently by us [15, 16] in D-MEM supplemented with 10% fetal bovine serum. VECs were grown at 37°C in a 5% CO2 atmosphere. The plasmid pBS-ap65-neo was constructed by cloning the coding region of AP65-3 in pBS-FdHAHA-neo (forward primer 5' GTCCAGCATATGATGCTCGCATCTTCA GTC-3' and reverse primer 5'-GTCCACGGTACCTTAGTAGAGTTGCTCGTATTC-3'). The parent plasmid pBS-FdHAHA-neo  was used by us recently . The parent plasmid was partially digested and the 1.7-kb ap65-3 gene was cloned into the NdeI and Asp718 sites giving rise to pBS-ap65-neo. In order to generate AP65 with the HA tag, the stop codon of AP65 was mutated and cloned into pBS-FdHAHA-neo resulting in pBS-ap65-HA-neo. The new plasmids were confirmed by sequencing. Plasmid DNA for transfection was purified using maxi prep columns (Qiagen, Inc., Valencia, CA). Transfection of T. foetus cells was carried out by electroporation . Parasites at early logarithmic phase of growth were used for transfection. Briefly, 4 × 107 parasites were centrifuged at 1,800 rpm at 4°C, and the pellet was resuspended in 400 μl fresh TYM before transferring into a 4-mm gap cuvette (BTX®, Genetronics, Inc., San Diego, CA) with 25 μg of plasmid DNA. Electroporation was performed at 320 V, 1000 microfarads and 725 ohms using the ECM 630 Electro cell manipulator (BTX®). Following the pulse, cells were placed on ice for 10 min and transferred into two T25 flasks with 50 ml of fresh TYM-serum medium. The cells were grown free of drug for 24 h followed by the addition of Geneticin (Invitrogen-Life Technologies, Carlsbad, CA) at 100 μg ml-1. Single cells were cloned using soft-agar plates . The DNA was isolated from single cell cultures using DNAZol (Invitrogen) and further purified by phenol-chloroform extraction. The presence of plasmid in single cell clones was confirmed by PCR amplification of the neo gene. The sense 5' GATCGGTACCATGATTGATTGAACA AGATGGATTG-3', and antisense 5'-CTTTAGACCAAGTTCGTGTCAGAAGAACT CGTCAAG-3' primers were used in the PCR reaction. Total RNA was isolated using the Trizol reagent (Invitrogen). Briefly, 1 μg of total RNA was reverse transcribed using SuperScript II RNase H- Reverse Transcriptase (Invitrogen) in a reaction volume of 20 μl. One μl of the reverse transcribed cDNA was used as template for the PCR amplification. The ap65 primer sequences used for amplifications were ap65-sense 5'-CAGTCAGTCGACCAGTTAGATATGGGTACAGAC-3' and ap65-antisense 5'-GTGACAGGATCCCGCTCGCAGTTAGCGCATGTAG-3'. The α-tubulin gene primers were sense 5'-ACTCTGCTGCCTCGAGCACGGTATC-3' and antisense 5'-GAAATGACTGGTGCATAAGAGC-3'. The common annealing temperature for the primers of both genes allowed for the ap65 and α-tubulin primers to be included in the same PCR reaction. Total protein from parasites was obtained as before using trichloroacetic acid (TCA) precipitation  and separated on sodium dodecylsulfate-polyacrylamide gel electrophoresis (SDS-PAGE)  prior to blotting onto Hybond-P membranes (Amersham Pharmacia Biotech, Pisscataway, NJ) for immunoblot detection with mAb 12G4 to AP65 and anti-HA mAb. The mAbs and epitope reactivity were described recently . Following blot reactivity with the mAbs, the bands were visualized by the chemiluminescence assay using horseradish peroxidase as the color developer (BioRad Laboratories, Hercules, CA). The hydrogenosomes were isolated as recently detailed . Briefly, 1 × 108 trichomonads were homogenized in buffer (250 mM sucrose, 20 mM KCL, 10 mM KH2PO4, 5 mM MgCl2 and 20 mM Tris-HCl, pH 7.0). The homogenate was centrifuged to sediment nuclei and costae at 1,500 g for 10 min at 4°C. The supernatant was then transferred to a new tube and centrifuged at 12,000 × g for 10 min. The sediment was then washed once more with homogenization buffer and was highly enriched for hydrogenosomes, which was confirmed biochemically as recently described . The sediment was resuspended in the buffer and stored at -70°C. Membrane isolation was also carried out as described recently . T. foetus (1 × 108) were resuspended in phosphate-buffered saline (PBS), sonicated, and subjected to low-speed centrifugation at 500 × g for 15 min at 4°C. The resulting supernatant was further fractionated by sequential differential centrifugations of 1,500 × g, 10,000 × g, and 100,000 × g for 30 min at 4°C. The supernatant was used for protein analysis. The ligand assay to detect adhesins that bind to host cell surfaces was carried out as before . Briefly, after fixation of the MS-74 VECs with glutaraldehyde, 106 epithelial cells were incubated with a trichomonal detergent extract derived from 2 × 107 solubilized parasites. After incubation, cells were vigorously washed to remove unbound and loosely-associated trichomonad proteins. Cells were boiled in electrophoresis dissolving buffer to elute the proteins bound to the MS-74 VEC followed by SDS-PAGE. The gels were further stained with Coomassie Brilliant blue for visualization, and duplicate gels were blotted onto Hybond-P membranes for immunoblot analysis using the mAbs as probes. AP65 from the membranes and hydrogenosomes derived from the fractionation experiments was immunoprecipitated using mAb DM116 . A standard immunoprecipitation protocol was used . Briefly, the fractions (0.5 mg) prepared as mentioned above, were mixed with 5.0 μg of mAb DM116 for 4 h at 4°C. The extract and mAb were mixed on a rotating platform for 3 h with Protein A-Sepharose beads. The beads were washed three times with PBS, and samples were eluted by boiling for 10 min in SDS dissolving buffer. Eluted proteins were resolved by SDS-PAGE, and immunoblot analyses and ligand assays were performed as described above. Immunofluorescence of AP65 on the surface and in hydrogenosomes of trichomonads was carried out using a modification of a recently-described procedure . Briefly, 1 × 106 logarithmic-phase organisms were washed twice with cold PBS and fixed with 4 % paraformaldehyde for 10 min at RT. Fixed cells were washed in PBS and permeabilized with 1% NP-40 for 45 min at RT. Trichomonads were then blocked with 5% BSA for 1 h at RT prior to incubation for an additional 1 h at RT with hybridoma supernatants of mAb 12G4 (1:100) and anti-HA mAb F11 (1:1000). Parasites were washed with PBS and incubated for 1 h at 37°C with fluorescein isothiocyanate-conjugated anti-mouse IgG (Sigma) diluted 1:100. Finally, parasites were washed twice with PBS and observed under 1000× magnification using the Olympus BX41 microscope. Immortalized human MS-74 VECs  were used for the adherence assay as recently described . Briefly, 2 × 104 MS-74 VECs were seeded onto individual wells of 96-well Costar flat bottom plates (Corning Inc., Corning, NY) and grown for 24 h in DMEM supplemented with 10 % fetal bovine serum (FBS). VECs were then washed twice with a medium mixture of DMEM:TYM (2:1; v/v) without serum. Trichomonads were labeled with [3H] thymidine for 18 h, washed three times with DMEM-TYM and resuspended. Then, 4 × 105 tritium-labeled parasites were added to the individual wells of the 96-well plate with a confluent MS-74 VEC monolayer and incubated for 30 min at 37°C. Cells were then washed thoroughly with the DMEM-TYM. Individual wells were placed in mini-scintillation vials and radioactivity was measured. The assay was performed with quadruplicate samples. Unless otherwise stated in the text, all experiments were performed numerous times and no less than on four different occasions. This work was supported by Public Health Service grants AI43940 and AI45429 from the National Institutes of Health. Members of the laboratory are also acknowledged for their suggestions and discussion of our work. ASK carried out the design of the study, performed transfections, Western blots, immunofluorescence, adherence assays and drafted the manuscript. VM constructed the plasmids, performed the Northern analysis, RT-PCR and wrote parts of the manuscript. JFA participated in the design of the experiments, offered suggestions during the experiments, and helped to draft the manuscript. All authors read and approved the final manuscript.